Oia, Santorini, Kyklades, Greece: A Fine Place to Read a Book. 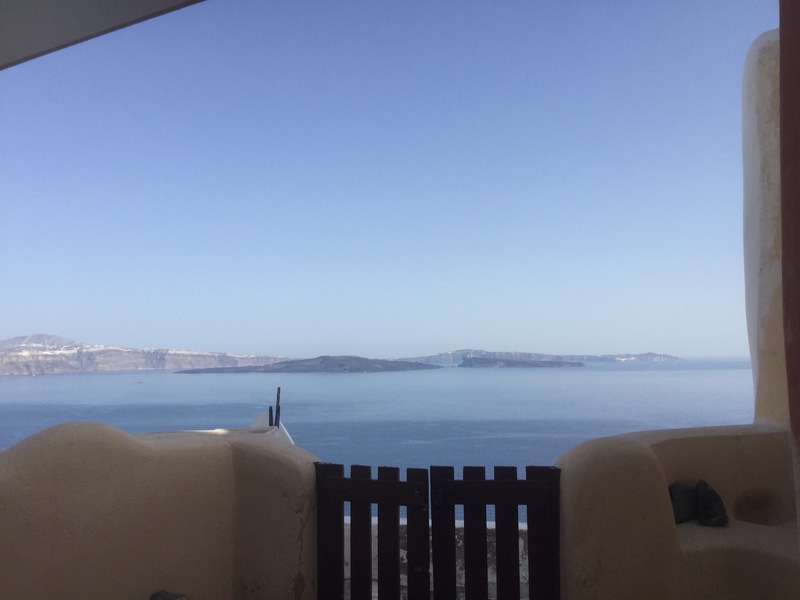 As I sit on the terrace that welcomed my friends and me to the cave dwelling we call a temporary home here in Oia, Santorini (of the Kyklades islands in the Greek, Aegean Sea), I am noticing that for the second day running, there are no clouds in the sky. My view is of the sea-filled caldera of an underwater volcano – one that several thousand years ago swallowed the landmass in in its center. A red, wooden slat-fence, about waist-high, blocks my immediate view of the stone-and-mortar path from our terrace to the small walkway a few feet from me. It also blocks maybe 10 degrees of my view of the Aegean. The water is a light blue – clear at close look along its rocky shores. Sailboats, catamarans, 50-foot yachts, and the occasional large ferry cross the twenty-mile diameter in front of me. Shadows from cave dwellings above intersect the Seussean, irregular stairwells meeting and leaving secondary and tertiary pathways, now that the Sun has passed overhead and begins its determined march toward the sea in the west. The porch is marble-tiled, and the same concrete or plaster that forms the walls everywhere here also frames my sitting place here. Beside our cave is a church built into the rocks. It appears to be uninhabited, but I wonder if it opens on Sundays for worshipping services. The blue dome with simple cross atop is visible from many places along the popular walkways at the core artery of the village. That avenue is awash in tourists shopping, tourists posing for photos – tourists getting in my way on the rare occasions when, out of necessity, I also use the path. On the recommendation of the owner of City Books in Pittsburgh’s North Side, an inspiring woman who also had the deep honor (I kid!) of being my creative writing professor at my alma mater, I went yesterday afternoon in search of Atlantis Books on the main drag in Oia. I was hot, drenched in perspiration, and wanted nothing more than to shower in cold water back at the apartment on the town’s southern slope. I was excited by the idea of a bookshop, though. I get that way wherever I go, because my priority at every destination is to find a suitable place to read a book. When I say that finding a good place to sit and read is a priority, I suppose I mean that it’s usually *the* priority of the day. Others come for the views, the sailing, or (heavens forbid it) the shopping. While I did snap a photo of the massed sunset-viewers on the peninsula to my south, I skipped the sunset last night in favor of continuing in my current reading project – still Keegan’s World War One. And nothing would have pleased me more than to relax in this environment and with this view with a good book. Back to Atlantis Books. I found that it was about 200 paces westward from where my side street (pedestrian, of course) meets the central thoroughfare in Oia. Despite actively looking for Atlantis Books, when I found in front of where I stood a curious stairwell leading to a bookstore, I yet stumbled upon it. And into what a world I stumbled. Two rooms, small but not cramped unless packed with visitors – which it sometimes is, I’ve since learned – the space is cavelike, as are many of the businesses and apartments in Oia. Domed ceilings have the appearance of being cut into the rock rather than constructed, and books dominate the scene – as is proper. There’s a decent collection of first editions, if you’re into that kind of thing. More interesting to me by far was the curation of the other books for sale in the establishment. Philosophy and history took primacy over much else, especially in the rearmost room. Overhead, a spiral-painted list of names stands in gratitude for business-saving donations some years ago (the aforementioned professor’s name nestles among these). The roof of Atlantis is a terrace, inviting yet on both of my visits oddly empty of visitors. It was an excellent place to sit and read a book. I bought a copy of The Greeks (H.D.F. Kitto), a non-academic survey of pre-Alexandrian, Hellenistic Greece. It’s fascinating. The store stamped its inked imprint onto the title page of the soft-cover volume, in red, and I’m glad to carry this all the way back to the States. I’m given to believe that the island empties of tourists, and most of the restaurants and shops close in wintertime. I’ve made a note to return again either during that low season or in the months immediately preceding or following the dearth. So my appreciation for Oia is mostly founded on two factors: the environment (all things considered) for reading and a fantastic bookshop. I’m a bookshop tourist, and I look forward to visiting, among others, the Shakespeare Company’s store in Paris. Do you have any favorite reading spots or bookstores in Naxos, Athens, Corfu, Vienna, Berlin, or Paris (some of my coming destinations)? I’d love to hear about them. Remember that all this summer’s posts can be found on this page! This entry was posted in Travelogue, Travelogue 2017, Travels and tagged aegean, atlantis books, backpacking, beaches, books, booksellers, bookshops, bookstores, city books, good places to sit and to read a book, greece, reading, sea, Slow Travel, sunsets, tourists, Walking, walking tour. Bookmark the permalink. 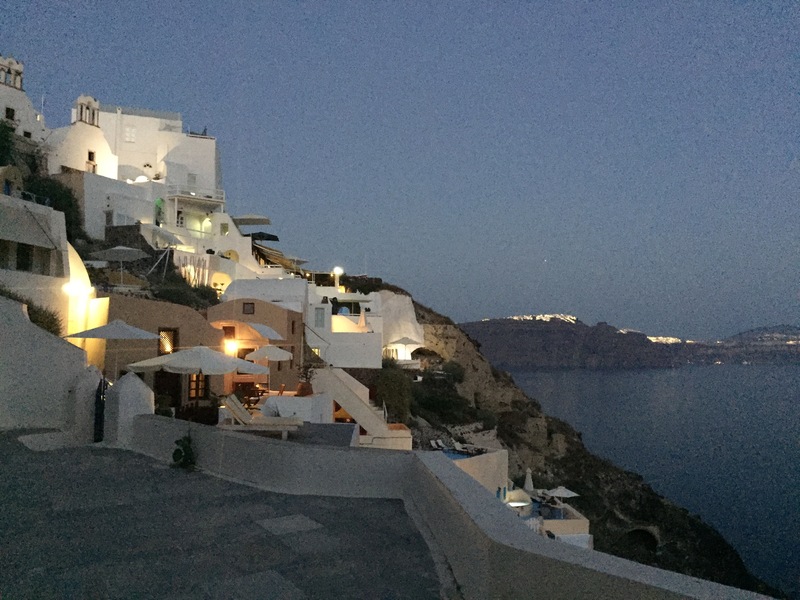 1 Response to Oia, Santorini, Kyklades, Greece: A Fine Place to Read a Book.